No time to get ready? No problem. And then 7:30 am rolls around on the morning of that 8 am class and suddenly I regret everything. Sometimes, early classes are a necessary evil. However, that doesn’t give you a pass to give up and throw on your sweatpants for the fourth day in a row (true story). 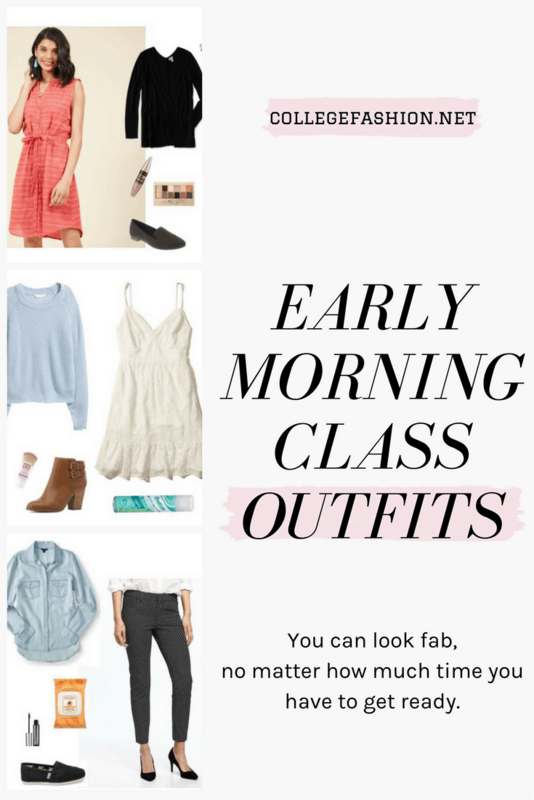 No matter when you woke up, here are some early morning class outfits and makeup ideas. Look at you, waking up an hour before class! You’ve basically done the impossible and for that, you should win an award. Whenever I find myself with some time to kill before my early classes, I reach for the “dressier” options in my closet instead of my “quick” options. That being said, this outfit is totally a quick “pull on and go” combo. The shirt-dress has a beautiful color that you can easily downplay with some simple flats and a classic cardigan. Even if you’re not fully awake, you can still look bright-eyed! Wake up your eyes with some mascara and some metallic eyeshadow, and then head off to class with no worries! Okay, so half an hour before class? You can make it work. Skip the shower and spritz on some dry shampoo to keep yourself looking fresh. If you need some makeup, reach for BB cream, since it has more benefits than just coverage (like moisturizing and SPF benefits!). Now, onto the outfit. I consider this another “pull on and go” combo, especially since it can be replicated with any pullover sweater and dress you have in your closet. It’s a no-brainer way to look like you have everything together, especially when you throw on some cute booties to go with it all! Uh-oh. Maybe it was an accident, or maybe you have a love/hate relationship with your snooze button (same tbh), but suddenly it’s 7:50 and class starts at 8. No time to waste! Grab a face wipe to freshen your face and swipe on some brow gel as a low-key way to add structure and effort to your look. 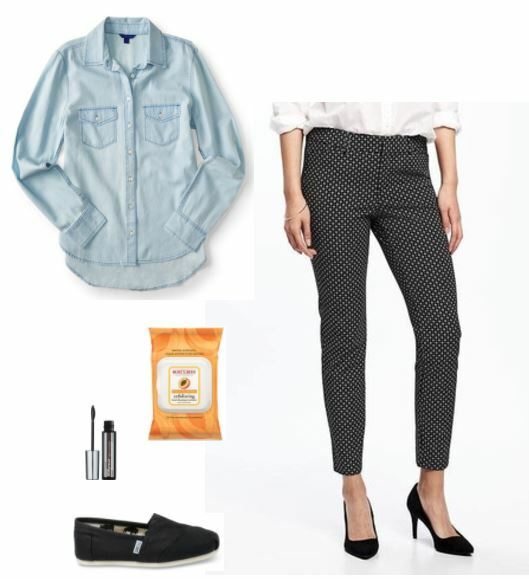 Reach for a classic, no-fail combo — chambray shirt with a cute pair of pants (the pattern on this one gives the look more fashion kudos). Throw on your trusty shoes and get moving! What are your go-to outfits for early morning classes? Have any tips you want to share? What was your last early morning class outfit? What does your schedule look like for this week, and what outfits do you need to complement them? Let us know in the comments!